Are you considering maybe going for some counselling, and wondering how to find a good therapist in Essex? You want to find a therapist in Essex who has the skills, knowledge and experience to be able to help you with whatever issue is troubling you. You want to find a counsellor or psychotherapist who you can feel safe with, and feel they really ‘get’ you. You probably want someone who isn’t all doom and gloom, but has a positive attitude. A therapist or counsellor with whom you can feel relaxed enough to share a laugh sometimes, even when you’re working on painful stuff together. 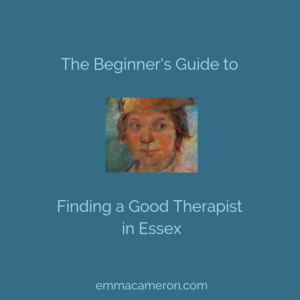 I’ve written this Beginner’s Guide to help you through the process of finding a good therapist in Essex. Where to look, what kind of therapist to seek out, and how to tell if a particular therapist might be a good choice for you. Important note: in this article I’m using the word ‘therapist’ as a broad term to include counsellors, psychotherapists, art therapists, and counselling psychologists. Basically, almost all therapists in those categories will be able to provide short-term counselling, which is most likely what you want to begin with anyway. Many people begin by consulting with their GP. Your GP can check in case there’s a physical cause. Your GP can also check in case there’s a more severe mental health problem which would need a referral to a psychiatrist. (This article is not really intended for you if you have a severe mental condition like psychosis). Your GP is most likely to diagnose you with anxiety, depression, or stress. Anti-depressant or anti-anxiety medication is sometimes prescribed. Note that this is more likely to be effective if it’s combined with therapy at the same time. Your GP may also suggest CBT (Cognitive-Behavioural Therapy) and add you to a waiting list. However, you may be keen to get started as soon as possible. Also, CBT may not be a good fit for you (especially if it’s delivered through an impersonal online programme, which to my mind isn’t therapy anyway!). If you are prepared to pay for good and effective treatment which starts almost immediately and lasts as long as you need it, you can find a good therapist in Essex yourself. There are many very good therapists in Essex. But it can be confusing to know where to begin your search. What kind of therapy or counselling would be best for you? Where do you find these therapists? And even when you’ve found someone who seems good, how can you tell if they’re the right person to help you? 1. What kind of therapy do I need? Do you want a therapist who is quite directive (gives suggestions, tips, and things you can do), or one who doesn’t say much? Or maybe someone who is more in between? Do you need experiential therapy or insight-oriented therapy? Ask yourself: How active or passive do I want my therapist to be? Every single therapist should be an extremely good and empathic listener. That is the number one rule, no matter what therapy modality they work within. Do you want a therapist who has a clear outline framework of what you will work on in each session, and sets homework each week for you to complete between sessions? If so, you may be interested in trying one of the following: Cognitive-Behavioural Therapy (CBT); Acceptance & Commitment therapy (ACT); Dialectical Behavioural Therapy (DBT); Cognitive-Analytic Therapy (CAT); Schema therapy. If you want to be challenged and confronted, Intensive Short-Term Dynamic Psychotherapy (ISTDP) may also suit you. Do you seek a therapist who occasionally takes the lead, gently steers and directs the session at times, and sometimes makes suggestions and contributes their own ideas about what you’re saying? Some (but not all) psychodynamic, psychoanalytic, transpersonal and Jungian psychotherapists and analysts would also fall into this category. Feel free to ask them about this when you schedule your first session. If they tell you that the answer would depend on the relationship between you, you can probably take that as a good sign! Would you prefer a therapist who mainly sits, listens, mmm’s and nods, and doesn’t introduce their own ideas or ask many questions, with the aim of helping you become ‘more of yourself’, free of their influence? Having listed so many different types of therapy above, I have to be honest with you and say that for some of those specialisms, it can be hard to find good therapists in Essex who have actually had the training. But you could at least ask the potential therapist how directive and active they think they are in sessions. Ask yourself: Do I want to look for Experiential therapy or Insight-oriented therapy? 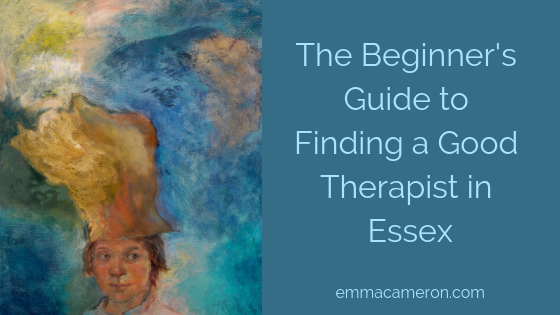 It used to be thought that therapy was all about helping you develop insight. Once the therapist understood where your troubles stemmed from, and explained it to you in a way that you could understand, you’d get better. That was the plan, anyway. And indeed, insight can be very useful. Therapy is partly about shining a spotlight on what’s been going on, and making links between your past and your habitual tendencies (“Ah, now I see why I have always had trouble with domineering men”). The trouble is, insight alone is rarely enough to change someone’s behaviour. Let alone their feelings! If your mum shouted at you a lot and often flew into violent rages, you may grow up feeling terrified of upsetting anyone. Unfortunately, it’s not enough to just understand on a cognitive (thinking) level that your fear of rocking the boat has its roots in your upbringing. This insight will probably not help you make the changes you need – let alone bring down your anxiety. You need more than insight. Insight-oriented therapies include Cognitive-Behavioural therapy (CBT), Transactional Analysis (TA), and some forms of psychoanalysis. Many forms of ‘talking therapy’ and traditional counselling lean a bit more in the direction of insight rather than having a clear focus of working with emotional experience. Experiential therapies include AEDP, Gestalt, Coherence Therapy, Hypnotherapy, ISTDP, Integrative Arts Psychotherapy, Art Therapy, Emotion-Focused Therapy, and the somatic therapies (e.g. Body psychotherapy, Sensorimotor, Somatic Experiencing). I offer experiential therapy (Integrative Arts and AEDP), because I find it particularly effective. It’s important to know that a lot depends on the individual practitioner. If a therapist is quite cut off from their own body and emotional expression, they’ll tend not to be able to offer you a truly experiential therapy, even if they claim to. Likewise, a psychoanalyst or CBT therapist who happens to be particularly able to connect to their own body and emotional world, may be able to work experientially with you. Ask yourself: am I looking for counselling, psychotherapy, or coaching? Soooo…. I will cautiously offer a few thoughts. And please know that there are many exceptions to whatever I state here. New problem? Or longstanding problem? One guideline that is sometimes offered is that counselling is for current issues that have come up fairly recently and don’t seem to have any roots in past experiences; whilst psychotherapy is for current issues which you sense might also have roots in the past. Counselling tends to be for short-term work; psychotherapy may be longer term and address deeper-rooted issues (however, this isn’t a blanket rule). A therapist who uses the arts (such as an Integrative Arts psychotherapist) or the body (Body psychotherapy, Sensorimotor psychotherapy, or Somatic Experiencing) can be a particularly good choice if you have difficulty finding the right words to talk about your feelings. Both counsellors and psychotherapists may work well with trauma, provided they’ve had enough specialist trauma training. Coaching is not suitable for trauma work. Broadly speaking, a psychotherapist is likely to have had a more extensive training than a counsellor. Psychotherapy training usually includes at least 4 years of weekly personal psychotherapy, and training placements which included hospital-level working and extended observation on mental health inpatient units (so they can recognise signs of severe mental health impairments, and how to work with them if necessary). Many psychotherapists did a counselling training first (Level 4), before going on to do their psychotherapy training (Level 7). A psychotherapist may have had more training than a counsellor. So does that mean a psychotherapist is probably a better therapist than a counsellor? Well, it might, but not necessarily. I think this really depends so much on the person, and how they use what they’ve learned/ are learning. I’ve known fantastic counsellors, and fantastic psychotherapists. A coach (or a ‘life coach’) could be someone who has read a few books about coaching; or they may have done a coaching training. Coaching trainings vary even more widely than counselling trainings. They might be minimal – a couple of weekends – or a year or more. (Compare that with the 4+ years of a typical therapy training). The trouble with working with a coach is that there often turns out to be deeper stuff going on under the surface-level problem you’re seeking coaching for, and the coach may not have the knowledge and skills to work at the level needed. Reputable coaches know when to refer someone for counselling or psychotherapy, but some coaches don’t have that awareness. Personally, I’d tend to warn people to steer clear of working with coaches, unless it’s very much for a career-related issue and you know you’ve never had a history of anxiety/ depression etc in your past. The other exception could be for people with no history of mental health problems who are wanting to come to terms with living in a larger body, for whom a specialist Health at Every Size (HAES) coach could be a good choice. Do you need a therapist in Essex who works with individual adults? Couples? Children? Teens? Older adults? Autism spectrum? Disability? Severe and enduring mental illness? Do you have a preference for seeing a male or a female therapist? Do you particularly want a therapist with lived experience of being in a certain demographic (e.g. ethnicity, LGBTQ+)? Do you think you might have suffered trauma? Look for a trauma-informed therapist and/or a therapist who has quite a lot of experience and isn’t too fresh out of college. A therapist who has an additional qualification in EMDR could be a good choice, too. Were you adopted? Or have an adopted child? (There is specific legislation regarding which therapists can work with adoption-related issues). What geographical area are you in? Is it important to you to find a therapist who’s local? How far would you be prepared to travel? In my experience many therapy clients are willing and able to travel for 40-60 minutes each way. Although I’m near Colchester, I find that it’s not unusual to have clients to come to see me for therapy from Ipswich, Chelmsford, Braintree, Harwich, etc. Is online therapy a good option for you? If you travel a lot – or if leaving your home is difficult – online therapy could be a good solution. When you contact a potential therapist, they may suggest you have a short chat on the phone to discuss what you are looking for. I like to offer a free 15-minute phone consultation with prospective clients, usually at a pre-arranged time so we can both talk in privacy, so that we can think together about whether I’m the most appropriate therapist to help them. Without going into detail, outline the problem you are looking for help with. Be open about any previous issues you’ve had, and ask them whether they think they may be able to help you. Don’t be afraid to be direct, even at this early stage, with asking them about things that matter to you. For example, it may be important to you that your therapist is comfortable and knowledgeable about issues to do with your sexuality, gender, faith, ethnicity, politics, or causes that are close to your heart such as social justice, animal issues or the environment. Discuss basic things like how much therapy will cost, and what time-slots they have available (if Wednesdays is the only day that could work for you, you’ll need to know they have availability on that day). How do you feel about the therapist? This is very important. When you and a prospective therapist have your first conversation, notice your reaction to them. Did you get a hopeful sense, and a feeling that this therapist seems like the kind of person you might grow to trust? Did you like them? Or did you feel put off? The single most important factor in whether therapy will work, is the quality of the relationship that the two of you can create together. Other factors matter too, but underlying everything there has to be a good relationship between therapist and client. One thing that can help, is to check if the therapist is registered with a professional organisation. Although it’s not a failsafe guarantee that a therapist will be good, it can help guide you as you try to choose. The organisations make certain checks for you, such as ensuring the therapist is properly insured to see clients, works ethically, has trained to a certain level, isn’t charged with any complaints or offences, and does a certain amount of up-to-date training each year. Look for a therapist who is registered with one of the following: UKCP (for psychotherapists), HCPC (for Arts Therapists), BACP or NCS (for counsellors and some psychotherapists), BPS (for psychologists), or BPC (for psychoanalysts). In addition, a therapist who is registered with ACTO will have had specialist training in working online as well as their main face-to-face qualifications. Is the therapist well trained? There are hundreds of trainings available to would-be counsellors and psychotherapists in Essex and beyond. Some trainings are very rigorous; some appear to be inadequate; and many are fairly good although perhaps lacking in some areas. Generally speaking, a Level 4 qualification is the minimum required to practise counselling (although sadly, a person can legally work as a counsellor in Essex even without a Level 4 diploma, which could leave their clients vulnerable). BACP registered therapists are trained to Level 4 or higher. A qualification at Level 7 indicates a more extensive training, such as a Masters degree level psychotherapy training. Most UKCP registered therapists are trained to Level 7. One thing I’d strongly recommend is that you choose a therapist who has had a good deal of personal psychotherapy themselves. UKCP require therapists to have a minimum of 4 years of weekly (or in many cases twice-weekly) personal psychotherapy during their initial training. Why is this good? It is very important that therapists learn through practice to get very comfortable with all their emotional ‘stuff’, otherwise they can unconsciously block their client from processing certain areas of feeling. Having had their own depth psychotherapy also helps a therapist to be able to be with the entire range of their client’s feelings – whether intense emotional pain, agonising envy, intense rage, or colourful exuberant joy. I hope this has inspired you to get started on finding a good therapist in Essex! Choosing a therapist can feel daunting, and it can take a lot of courage to reach out and start to get help. But it’s worth doing sooner rather than later. You have already tried other strategies to help with your problem, and the fact that your difficulties remain, tells us that it will be best to have some sessions with somebody who is really well placed to help. Might I be the right therapist for you? Have you had success in finding a good therapist in Essex? How did you go about finding them? What did you look for, and how did it work out? Maybe you have a couple of tips to help other people who are looking for psychotherapy or counselling in Essex. Let us know in the comments below!